Are you looking to venture into a cleaning business in Missouri? If the answer is yes, look no further than The BBQ Cleaner. We are offering a stellar BBQ cleaning business opportunity in Missouri! Almost every household in the state owns a BBQ set. Everyone loves to cook, but cleaning up after that can prove to be a hassle most of the time. This shows that there is money to be earned. In other words, the BBQ cleaning specialist that families in Missouri can count on is you! When you work with us, you can rest assured that we will provide all the equipment that’s necessary to start the business from the get-go. As we are not selling you a franchise, The BBQ Cleaner does not collect royalties on a monthly or yearly basis. What’s more, you can have zero experience in the BBQ cleaning industry to start this business. The business support that we provide lasts for a lifetime as well! Why Start a BBQ Cleaning Business in Missouri? Pleasant Outdoor Conditions: With plenty of sunshine available in Missouri, many families will be out for many BBQ sessions throughout the year. You can look forward to meeting the needs of those who need grill cleaning services. No Shortage of Potential Clients: Many Missouri homes have their own grills, but not many want to go through the hassle of cleaning them. They can turn to your services. Not-so-competitive Business Niche: You never have to worry about getting stuck in a highly competitive niche. When it comes to BBQ and grill cleaning services in Missouri, you will not have to face fierce competition. Enjoy Business Growth: You just need to add more vehicles, or hire and train more staff to meet your growing business operations in Missouri! How Does The BBQ Cleaner Help You Get Started in Missouri? Working with the The BBQ Cleaner ensures that you gain access to lifetime business support, which is designed to help you maximize earning potential when it comes to providing grill cleaning services in Missouri. Since our inception, we have built an extensive network comprising more than 180 operators nationwide to date. If you ever need to restock on cleaning supplies or marketing materials, you can do it through our site with exceptional ease. 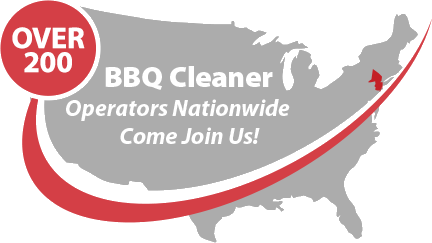 Talk to us today to find out more about this stellar BBQ cleaning business opportunity in Missouri!